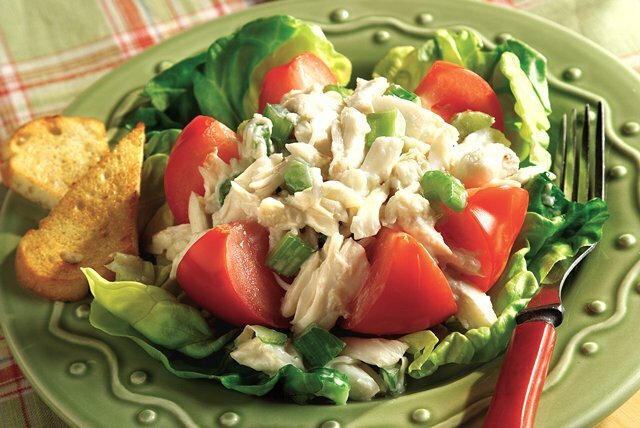 Mix up your salad routine with a tasty Tomato-Crabmeat Salad that can be ready in just 20 minutes! This crabmeat salad is perfect for any special occasion. Mix crabmeat, celery, dressing, salt and pepper. Cut each tomato into 6 wedges, almost to stem end. Fill with crabmeat mixture. Serve on lettuce-covered plates. Canned crabmeat can contain tiny pieces of shell, so use your fingers to pick over the crabmeat before adding to a recipe.